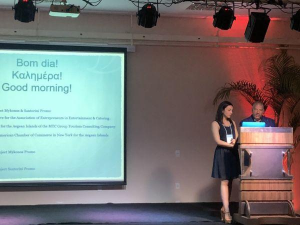 The Mykonos – Santorini – Greek South Aegean Islands Promo team participated in the first tourism workshop “Mykonos Approach”, which was recently held in Brazil, showcasing the authentic Greek hospitality and the luxury services of the destination. Promotions Director, Mrs Alexia Petoni, informed the participants about the South Aegean Islands, focusing in tradition, gastronomy, history and luxury services of the destination. More than 20 Brazilian tour operators as well as officials and representatives from associations and other tourism organizations got acquainted with Mykonos-Santorini-Greek South Aegean Islands Promo project and the promotional action plan, aiming to attract high profile visitors. Strategy Manager of the project and Ambassador of the Hellenic-American Chamber of Commerce in New York, Mr. Konstantinos Skagias, in his address, stressed the opportunity offered to both sides to create cooperation in tourism with mutual benefits. The tourism workshop was organized by Tourism Department of South Aegean Region and the Vice-Governor of Culture, Mr.Stylianos Briggos in cooperation with the Federation of Commerce of Goods, Services and Tourism of Santa Catarina and is part of the fraternization of the two regions and the creation of new partnerships and alliances at tourist and cultural level. Among the participants of the event were the Brazilian General Secretary of Tourism, two members of the parliament, the President of Tourism Department of Santa Catarina, the President of the Federation of Commerce, Services and Tourism of Santa Catarina, the President of the Greek Community, the Chairman of the Tourist Board of the Municipality of Florianopolis and the President of Travel Agents Association. The event was covered by journalists from four national channels, two local and 15 travel bloggers. During their stay in Brazil, Mr. Skagias and the team of Mykonos – Santorini – Greek South Aegean Islands Promo project had B2B meetings with major Brazilian tour operators, specialized in outgoing travel as well as with the board of directors of the Federation of Commerce of Goods, Services and Tourism of Santa Catarina. They showcased the new mobile applications and interactive social networking tools, which are designed by a team of experts in the fields of new technology and tourism from London, New York and Mykonos (MTC Group team and www.MykonosBest.eu, www.SantoriniBest.eu). These apps combine the traditional forms of promotion with the digital innovative technology, aiming to to attract upscale millenial visitors to Mykonos and to enhance their knowledge for the Aegean islands. The representatives of the Federation showed great interest for the innovative approach in promoting the Aegean islands worldwide, who congratulated the members of the project and discussed ways in which respective programs could be developed for the destinations of Santa Catarina. Mr. Skagias offered his support. The Federation of Commerce of Goods, Services and Tourism of Santa Catarina was founded on August 10th, 1948 and has since been a legitimate representative of the interests of the tertiary sector at the state level.